The fast-growing and unregulated art market, invaded by art-collecting novices, has already seen a proliferation of hand-holding art advisors. Now we are seeing a new art advisor enter the market: specialist lawyers helping to settle ownership, copyright and authenticity disputes. “Even people that have experience make common mistakes,” says Brian Kerr, partner at the recently launched art law firm Spencer Kerr. “The works being sold are of staggering value so the stakes are just too high.” That’s precisely when people reach for their lawyers. 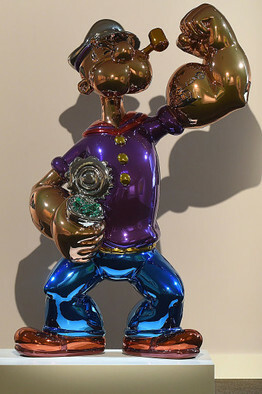 Ronald Perelman purchased Popeye, by artist Jeff Koons, from Larry Gagosian. Consider billionaire art collector Ronald Perelman, who sued fabled art dealer Larry Gagosian, claiming Gagosian “took advantage of his position of trust” and misrepresented the value of certain works. According to the lawsuit, Gagosian overvalued works sold to Perelman and undervalued pieces it bought from the collector. Among the works changing hands were sculptures by Jeff Koons and Richard Serra and paintings by Cy Twombly. In December, Perelman lost in an appeal with a five-judge panel essentially ruling that the sophisticated collector could have conducted his own due diligence. Kerr represented London-based filmmaker Joe Simon-Whelan, in 2009, against the Warhol Foundation for the Visual Arts. Simon-Whelan purchased a Warhol silkscreen self-portrait for $195,000 in 1989, which back then was deemed genuine by the foundation. He resubmitted it to the foundation for authentication, in 2001 and 2003, just before an anticipated $2 million sale, and this time the work was twice branded a fake. In the end, the Warhol foundation spent $7 million on its defense. Simon-Whelan eventually folded and was awarded nothing, claiming he was “deeply saddened” about being “unable to reveal the truth in court, but faced with bankruptcy, continuing personal attacks and counterclaims, I realized I no longer stood a chance of proceeding further.” Shortly thereafter, in 2012, the Warhol authentication board was disbanded. Much of Kerr’s current work involves helping shell-shocked collectors recover scraps from among the emotional and financial wreckage, after purchasing a fake. 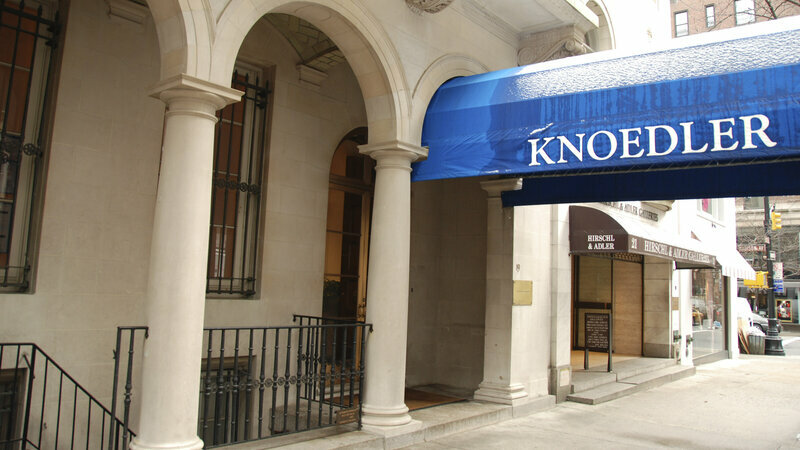 But the law firm is also connecting its previously-burned clients with outside consultants and art advisors to help them establish clear provenance and authenticity before they buy new work. “The goal is that when [clients] stick up their hand at an auction or buy from a gallery, that the legal side and consulting work is done hand-in-hand,” Kerr says. He adds that the consultants bill separately for their services and the law firm collects no fee for referring the business. It has evolved into one of New York’s longest-running fights over an estate. For more than a decade, the family of C. C. Wang, a collector whose name graces a gallery at the Metropolitan Museum of Art, has been battling over a trove of classical Chinese paintings and scrolls that has been described as among the finest in the world. Now, the feud has escalated. In the past month, two of Mr. Wang’s children, who have been fighting in Surrogate’s Court in Manhattan since his death in 2003 at 96, filed lawsuits in state and federal courts accusing each other of looting and deceit. But beyond the family strife, a broader issue is dismaying Chinese-art experts for whom the Wang collection has long been a source of wonder. Dozens, perhaps hundreds, of works from an estate once valued in court papers at more than $60 million have gone missing, including an 11th-century scroll, “The Procession of Taoist Immortals,” that is viewed in China as a national treasure. “This is heartbreaking, and it is happening right here in the city,” said Laura B. Whitman, a specialist in Chinese art formerly with Sotheby’s and Christie’s, who used to visit Mr. Wang at his apartment in New York to view his collection. Divining who rightfully owns these works, and who is to blame for the disappearance of so many of them, has consumed the family for more than a decade. The case has become so complex, and so expensive, that the Surrogate’s Court has suspended discussing matters of inheritance until it can come up with a reliable inventory of what was initially in the collection to see if the estate will be able to pay lawyers and other creditors. Among the few certainties at this point is that Mr. Wang demonstrated the ability to acquire objects of historical importance, objects that since his death have increased many times in value as the Chinese art market has boomed. Born near Suzhou, China, in 1907, he moved to the United States during China’s political upheavals in 1949, settling in Manhattan, where he built a career teaching, consulting at Sotheby’s, and dealing in real estate and in art. 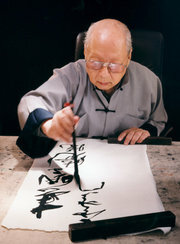 He became the dean of the rarefied market for Chinese art in New York and was an accomplished artist in his own right. By the end of the 1990s, the Met had bought some 60 works that were once part of his collection and named a gallery in his honor. Among the Met acquisitions was a colossal hanging scroll titled “Riverbank,” attributed to the 10th-century painter Dong Yuan, but which attracted its own controversy after some scholars declared it a 20th-century forgery. Maxwell K. Hearn, chairman of the Met’s Asian art department, said Mr. Wang acquired much of his important collection early on, when the market for Chinese art didn’t exist. Before his death, Mr. Wang left some works to his daughter Yien-Koo Wang King, now 79, and some to his son, Shou-Kung Wang, now 85, both of whom served during different periods as confidant and business agent to their father. The Classic Greek mixing-bowl attributed to the artist Python (active ca. 350 – 325 BC) of Poseidonia (Paestan) on display in Gallery 161 of the Metropolitan Museum of Art in New York City should be returned to Italy because it has no collecting history before 1989 and has been matched with photographs in the possession of a convicted art dealer, according to the work of University of Cambridge’s Christos Tsirogiannis. (You can see The Met’s description of the object online here ). 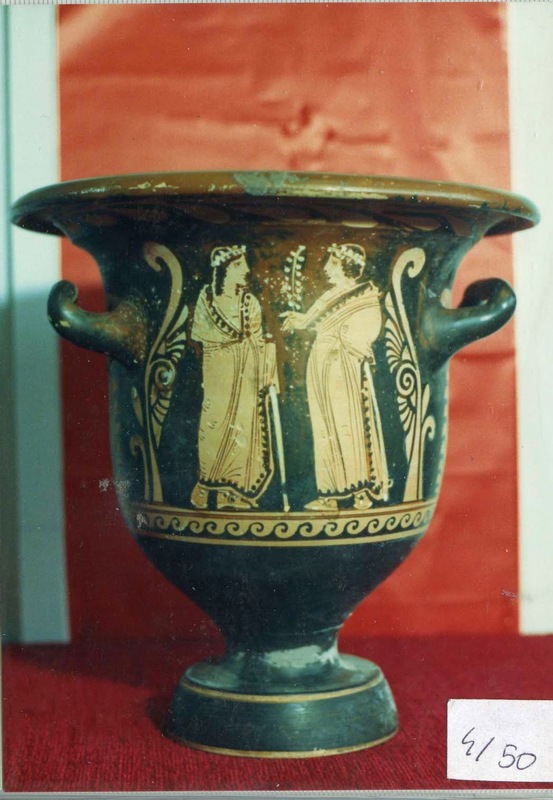 This terracotta bell-krater, described in detail in Dr. Tsirogiannis’ column “Nekyia” in the Spring 2014 issue ofThe Journal of Art Crime, appears with soil/salt encrustations in five photographs from the confiscated Medici archive – including one Polaroid image. Then, “The object was auctioned by Sotheby’s in New York in June 1989 and the same year appeared as part of The Met’s antiquities collection,” Dr. Tsirogiannis reports. Art dealer Giacomo Medici was convicted in 2005 of participating in the sale of looted antiquities. The story of how illicit antiquities were sold to art galleries and museums in Europe and North America was told in the 2006 book by Peter Watson & Cecilia Todeschini, The Medici Conspiracy: the illicit journey of looted antiquities, from Italy’s tomb raiders to the world’s greatest museums(Public Affairs). The Medici archives (or “Medici Dossier”) were described as “thirty albums of Polaroids, fifteen envelopes with photographs, and twelve envelopes with rolls of film … [along with] 100 full rolls of exposed film … [for] a total of 3,600 images” found in Medici’s warehouse of antiquities in Geneva in 1995. . . . .
“HE WHO controls the past controls the future.” Orwell’s dictum now faces a new test. Shortly before Russia annexed Crimea, the Bakhchisaray museum, north of Sevastopol, lent some valuable artefacts to an exhibition in the Netherlands. The question as to which country these (and other objects from Crimean museums) should return is creating a diplomatic conundrum. “Let yourself be overwhelmed by the gold of Crimea,” boasts the Allard Pierson Museum in Amsterdam. Never before has Ukraine lent so many mostly Crimean treasures. The Black Sea peninsula is filled with gems left by invaders over the centuries. 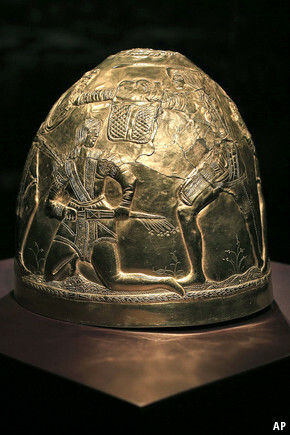 The exhibition includes a Scythian gold helmet from 400 BC, pottery from Greek colonisers and a lacquered Chinese box that came along the Silk Road. “We have given our very best objects,” sighs Valentina Mordvintseva, a curator at the Crimean branch of the Institute of Archaeology. She fears she may not see them again. Who is the rightful owner? On legal grounds, Kiev has the upper hand because the Allard Pierson signed a loan agreement with the Ukrainian state. And as the Netherlands does not recognise Russia’s annexation, Ukraine still owns the property. Yet the Dutch also signed contracts directly with the lending museums. And, says Inge van der Vlies, a professor at the University of Amsterdam, there is an ethical case for returning the objects to them. But there is no guarantee that Russia might not pinch the pieces the moment they arrive. The Dutch foreign minister, Frans Timmermans, does not wish to meddle but he also wants to avoid being seen to accept a new form of art looting. This may be impossible; whether the gold returns to Crimea or to Kiev, each side will accuse the Dutch of pilfering. . . . .